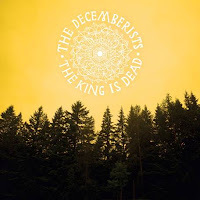 The Decemberists declare "The King Is Dead!" The Decemberists have become known for their epic take on indie rock. Long songs with lyrical complexity were key to the band's music creation. Well, it looks like they're changing it up on their upcoming release, The King Is Dead (out January 18th on Capitol Records), which lead singer Colin Meloy promises a simpler, more restrained record. Peter Buck and Gillian Welch are both set to guest on the record. To get the first taste of the new material, fans just might have to tune into Conan O'Brien's new show on TBS where the band perform the lead single, "Down by the Water" on November 18. The full track list is available after the jump, and album art is to the left.